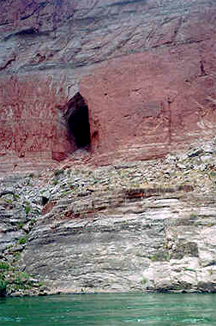 One of many caves discovered on the Colorado River. “I was journeying down the Colorado river in a boat, alone, looking for minerals. Some forty-two miles up the river from the El Tovar Crystal Canyon, I noticed, on the east wall, stains in the sedimentary formation about 2,000 feet above the river bed. There was no trail to this point, but I finally reached it with great difficulty. 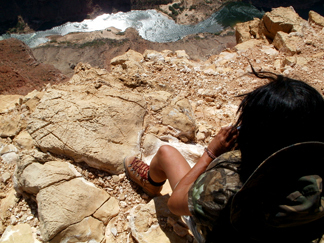 “The entrance is 1,486 feet down the sheer canyon wall. Above a shelf which hid it from view from the river, was the mouth of the cave. There are steps leading from this entrance some thirty yards to what was at the time the level of the river. When I saw the chisel marks on the wall inside the entrance, I became interested. Securing my gun, I went in. I gathered a number of relics, which I carried down the Colorado to Yuma, from whence I shipped them to Washington with details of the discovery. 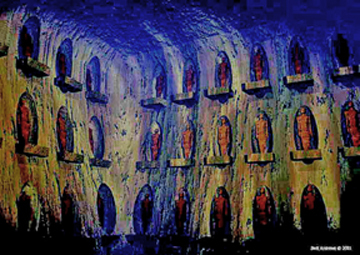 “From the long main passage, another mammoth chamber has been discovered from which radiates scores of passageways, like the spokes of a wheel. Several hundred rooms have been discovered, reached by passageways running from the main passage, one of them having been explored for 854 feet and another 634 feet. The recent finds include articles which have never been known as native to this country, and doubtless they had their origin in the orient. War weapons, copper instruments, sharp-edged and hard as steel, indicate the high state of civilization reached by these people. “The passages are chiseled or hewn as straight as could be laid out by an engineer. The ceilings of many of the rooms converge to a center. The side-passages near the entrance run at a sharp angle from the main hall, but toward the rear they gradually reach a right angle in direction. “Over a hundred feet from the entrance is the cross-hall, several hundred feet long, in which are found the idol, or image, of the people’s god, sitting cross-legged, with a lotus flower or lily in each hand. The cast of the face is oriental. 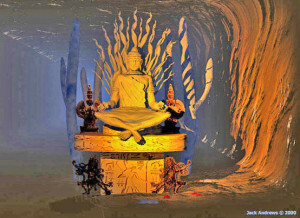 The idol almost resembles Buddha, though the scientists are not certain as to what religious worship it represents. Taking into consideration everything found thus far, it is possible that this worship most resembles the ancient people of Tibet. Researcher Jack Andrews’ computer rendering of the golden Buddha. 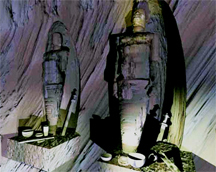 “Surrounding this idol are smaller images, some very beautiful in form, others crooked-necked and distorted shapes, symbolical, probably, of good and evil. There are two large cactus with protruding arms, one on each side of the dais on which the god squats. All this is carved out of hard rock resembling marble…. “On a bench running around the workroom was some charcoal and other material probably used in the process. There is also slag and stuff similar to matte, showing that these ancients smelted ores, but so far no trace of where or how this was done has been discovered, nor the origin of the ore.
“Among the other findings are vases or urns and cups of copper and gold, very artistic in design. The pottery work includes enameled ware and glazed vessels. Another passageway leads to granaries such as are found in the oriental temples. They contain seeds of various kinds. One very large storehouse has not yet been entered, as it is twelve feet high and can be reached only from above. Two copper hooks extend on the edge, which indicates that some sort of ladder was attached. These granaries are rounded, as the materials of which they are constructed, I think, is a very hard cement. A gray metal is also found in this cavern, which puzzles the scientists, for its identity has not been established. It resembles platinum. Strewn promiscuously over the floor everywhere are what people call “cats eyes’, a yellow stone of no great value. Each one is engraved with the head of the Malay type. Jack Andrews’ rendering of the mummies based on Kincaid. Jack Andrews’ digital rendering based on Kincaid’s description. “One thing I have not spoken of may be of interest. There is one chamber of the passageway which is not ventilated, and when we approached it a deadly, snaky smell struck us. Our light would not penetrate the room, and until stronger ones are available we will not know what the chamber contains. Some say snakes but others think it may contain a deadly gas or chemicals used by the ancients. No sounds are heard, but it smells snaky just the same. The whole underground installation gives one of shaky nerves the creeps. The gloomy feeling is like a weight on one’s shoulders, and our flashlights and candles only make the darkness blacker. Imagination can revel in conjectures and ungodly daydreams back through the ages that have elapsed till the mind reels dizzily in space. We all agreed that the week of May 14th through May 17th would work for everyone and planned accordingly. Ron and Dar offered to take charge of meals and the mess tent and arrived fully stocked and loaded towing an ATV; J.C. came armed and dangerous so we elected him and Audrey security; Gary served as navigator and Clifford brought his years of expertise out in the field assessing Indian reservation sacred sites. I filmed the entire trip and tried to be as unobtrusive and invisible with the camera as possible. The team arrived at the foot of Bodeway Mesa—near the Notch–located about 14 miles east of the confluence rim on the afternoon of May 14th. This was the last grouping of trees until the canyon. Sheltered on the east and south the western base of the mesa made a perfect “base camp.” Our little enclave set up tents and unloaded an impressive amount of food and gear that Ron and Dar had bought, and JC remarked that we should call our little town “O’Brienville,” I countered with “JC Land.” Thankfully, neither name stuck. The first day was spent on a scouting expedition featuring Gary, Cliff, JC and myself. The maze of farm roads and jeep trails that spider-webbed out across the plateau was a jigsaw puzzle challenge, but we were able to navigate our caravan out to the confluence rim. David and Jen arrived to the camp that evening and missed the first trip out to the confluence. The following day arrived with a cloudless sky and the incessant wind. The weather was hotter than the prior day, in the low to mid 90s and dead bone dry. Our fiendishly steady 20 to 30 mph wind scoured the treeless plateau and kicked up dust devils that raced across the plain as we planned our route. Thankfully, we had a rather sheltered campsite from which to stage our forays. As we left the second morning and headed west toward the rim, the wind increased in velocity. By the time we arrived at the rim sustained 45-50 mph blow-drier-like wind gusts made thoughts of flying a remote controlled helicopter null and void. Two interesting discoveries had been made the previous day that should be noted. 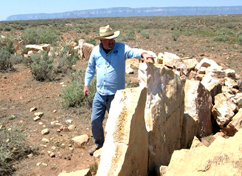 About 3 to 4 miles directly east from the confluence point on the rim, we discovered the remains of two “quasi-megalithic” ruins made from slabs of limestone quarried from a nearby shelf. One was a small nine to 10 foot diameter structure with low walls and tumbled down blocks of stone. The other—located a hundred or so yards away, was a large 70 foot by 50-foot oval shaped enclosure that featured a number of standing slabs that neared two tons in weight. David did a walk around and concluded that the structure “was a sheep pen,” and had “probably been made with the help of a front loader or backhoe…sometime in the 1950s.” I pointed out that it sure seemed like whomever built these structures went to a lot of trouble to build a simple sheep pen and JC later checked with some elder Navajos who claimed they had never heard of this type of sheep pen construction and doubted that was what they were. Coyotes and other predators could easily jump inside and make short work of sheep trapped inside. As I walked around the strange formation, I didn’t see any scrape marks or obvious evidence that the stones hade been moved and stacked with heavy equipment. A real mystery to be sure! The second notable event before reaching the rim was the discovery of a government issue Chevy passenger Suburban parked at a relatively sheltered point just back from the edge. 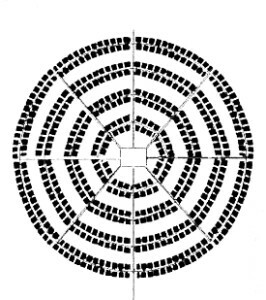 The lack of tire tracks and the sand build up around the wheels indicated that the vehicle had been parked there for several days, perhaps a week or more. After we returned from the trip we attempted to find out which governmental car pool was responsible for the vehicle, but we haven’t yet been able to ID who left the vehicle at the rim of the canyon or why it was parked there in the first place. For the past six plus years I have professionally guided private trips to the south rim of Grand Canyon around 200 times. Grand Canyon is undoubtedly the only location I’ve experienced that I could never become bored or jaded about no matter how many times I visit. Every trip brings some kind of new insight or visual details that help create a fresh, vibrant experience each time I stand and gaze at this natural wonder of the world. Few locations on the planet can rival this amazing “great wound in the earth,” as it was described to Francisco Vasquez de Coronado by the Hopi in 1540. 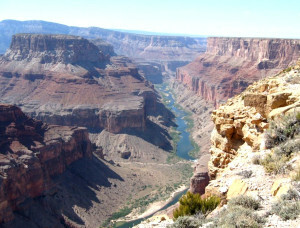 And no other location I know of along the canyon rim can rival the point at the confluence where we stood in awe. Up close, immediate and in your face, this spot literally takes your breath away. Words cannot adequately describe the overwhelming majesty of the narrow peninsula on the rim that extends out over the confluence of the two Colorado Rivers. The north and south rims are set back from four to 7 miles from the river—not so here at the confluence point. The canyon literally wraps around you in awe-inspiring splendor with the river–flowing directly beneath you–over 4000 thousand feet below. This is definitely not a place for wimps or anyone at all afraid of heights! The swirling winds moaned and whistled around us. Were we being visited by the ghosts of countless thousands of Indians that called the canyon home for thousands of years? Naw, but the sound and the feeling was a bit disconcerting standing on the rim with 40 to 50 mph winds gusts fiendishly pushing at us from behind. Visiting this remote location was a 95-degree test of courage by heat, wind and elevation and the team agreed that the original idea of flying a RC helicopter out over the rim to map the cliff face was out of the question. Later, I came up with a work-around solution for a future trip. 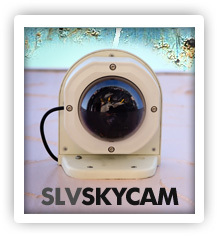 Why not fly a kite with a third string for steering that was equipped with a self-leveling video camera mount? With the prevailing winds blowing from the rim out over the canyon, this approach may have a chance of succeeding. Combine this with a second team on the river working in tandem and who knows what we could find. 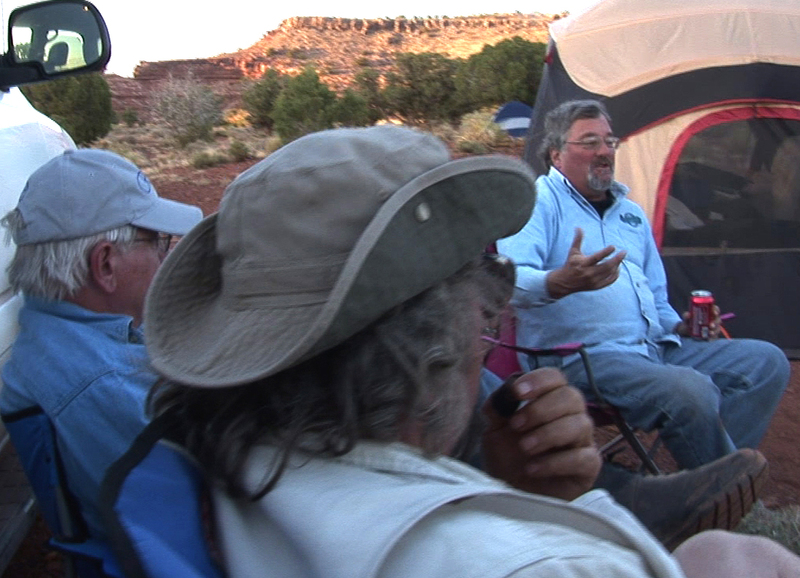 …i was informed by my close veteran trail buddy that two of his best camping buds were recently found shreaded by a cave entrace they discovered in arizona. he stated the reptillian cave dwellers were responsible and that he and his mexican friend pablo had a midnight full moon shoot-out with the retiles throwing stones and pablo and himself using 30-30.win.rifles and 10 guage slug guns. –they claimed 6 kills on the reptiles but that the lizardmen dragged thier dead back into the cave complex. the two men were miners of gold in old pre-dug mines. he said he feels sorry for anyone who may stumble onto the historic mines and meet these snake people way out in the lonley desert by accident. A joke? YOU must be joking. Did you read all four parts? What trip are you talking about. Who are you and why are you leaving cryptic comments on my site? It was made ancient Korean. So were you in the area that is off limits?